You’ll love these solid examples of gorgeous cement surfaces. Concrete is super durable and easy to care for, and it’s not just for industrial spaces anymore. This unassuming material can be found in modern, rustic, and even more formal homes. And we have to say, it’s top-notch in bathrooms. Take this streamlined countertop—paired with ultra-minimalist faucets, an ornate mirror, and a pretty chandelier, it’s pure glam. A concrete countertop makes marble flooring and glossy white subway tile feel warmer. Natural wood and minimalist lighting go perfectly. Love a bit of color? Display an assortment of brightly hued towels, flowers, or soaps to ramp up the look. Concrete can definitely go modern. Take a look at this lovely scene with a trough sink and wall-mounted faucets. An unframed mirror and sleek wood vanity keep the space from feeling unnecessarily complicated. Stick with one accent color for uniformity, and switch it out with the seasons. These greens are clean and fresh, but gold, blue, or red would be equally as charming. This bathroom is proof that concrete is anything but drab. A marble look is so lavish and calls for no dressing up. Baskets and gold touches soften the otherwise austere retreat. Clean lines and a super smooth surface make this countertop a standout. Unassuming mirrors and lighting keep the space airy and uncluttered. And the wooden dowel towel bars are surprisingly innovative. They look great and blend right in. For a look that is both edgy and sweet, try your hand at a DIY concrete vanity. The stockiness of the piece makes a statement and lends a sturdy base to a thick slab marble vessel. A floating wood shelf is an unfussy touch. 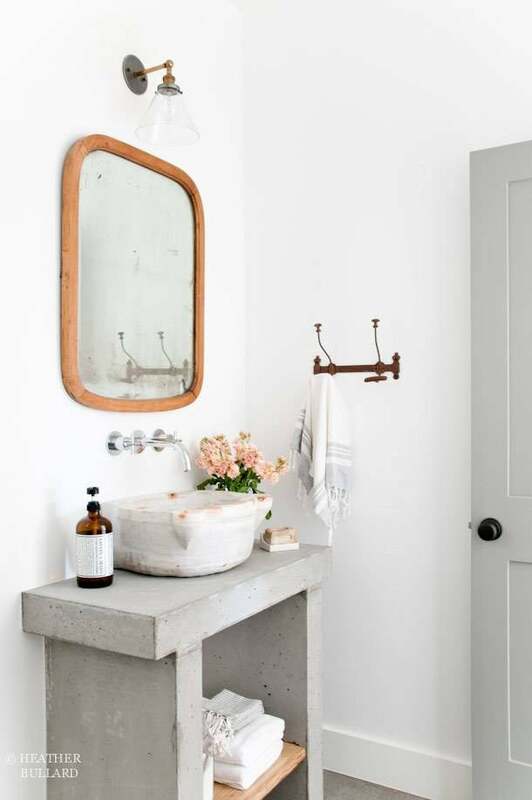 A chunky concrete vanity top and sink with metal base give an industrial-rustic vibe. Notice how the walls are cement, too. The glossy chrome faucet adds a refined touch. If you are considering going with concrete countertops but also have a deep love of the clean white look, this stunner ought to do the trick. Gleaming white tile and a minimalist metal stand make this thin counter look formal. A simple design can easily be enhanced with the right touches. For a feminine look, add in softness with fabric, blooms, crystal, and woven baskets. This scene stepped straight out of the French countryside. For a look that is totally straightforward and no frills, let a thick concrete countertop take center stage. Other elements in this bath, like bare bulb lighting and an extremely simple wall faucet, are not competing for attention. Here, a concrete counter is topped with a low-profile vessel sink and slender faucet. The round mirror gives the edgy tile a softer feel. And let’s talk about the floor—graphic looks so good underfoot. Notice how a sturdy countertop is balanced by lightweight pieces. From the discrete faucet, to the inconspicuous mirror, to the modest lighting, the look here is clean-lined and uncluttered. There is a lot of good stuff going on in this powder room. Concrete with gold? It works. The bright finishes go with the rugged cement vanity, and the demure tile floor is an ideal touch. Don’t even get us started on those adorable lighting baubles. Tuck a concrete countertop into a nook, and you have a low maintenance clean up area with endless visual appeal. The bright spot is unelaborate but wildly interesting.